By Olivia Lahs-Gonzales, essay from the book Larry Fink: Attraction and Desire: 50 Years in Photography, published by The Sheldon Art Galleries. Saint Louis, Missouri. 2011. My first experience of Larry was when I heard his piano playing drifting up from the lobby of my hotel as I descended the stairs to meet him on the first day of my visit to his farm and studio outside of Easton, Pennsylvania. The farm, where he has lived since 1974, is a compound of several buildings, one of which houses his studio and archives and the studio of his partner and wife of 19 years, the sculptor Martha Posner. Surrounding the house, a portion of which was built in 1750, are woods, saucer-sized dahlias, bamboo stands, and a menagerie of animals (an emu, a llama, a horse, guinea hens, chickens, doves, tropical fish, a turtle, a dog, cats and toads, among other beasts), some roaming, others penned. Found-object sculptures find their place on fences and between bushes. The house itself is cozy—full of collections of rocks and shells, dolls, more found objects, paintings and drawings by friends and colleagues, and subtly, in between it all, the occasional classic Fink photograph is hung with a self-effacing lack of pomp. 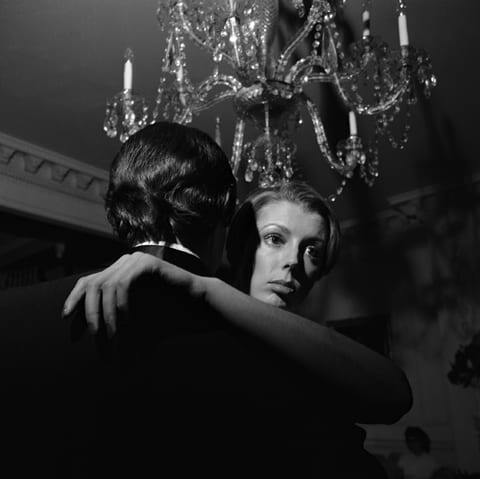 Larry Fink is a man who clearly enjoys the physicality and sensuality of the world around him. Passion- ate and outspoken with an impish nature, he enjoys good food and earthly delights. Having come of age in the beat generation, Fink has retained that sensibility. His written correspondence takes the shape of a beat poem or a jazz lick, but the images he creates with the camera are drawn from multi-layered influences. Emanating from a passionate psyche, they are also informed by a deep understanding and appreciation of the history of art. Though photographic influences, like Henri Cartier-Bresson, André Kertész, Brassaï, Robert Frank, and Lisette Model, his teacher, played a role in the formation of Fink’s early vision, sparks of Goya, Daumier (a print by the artist hangs in Fink’s studio), and George Grosz, the atmosphere of a Cara- vaggio and the psychology of a Rembrandt, can also be found in his luminous and theatrical works. An Austrian Jew, Model had fled Europe in 1938 and was working freelance in New York, teaching at the New School for Social Research, and offering private lessons. 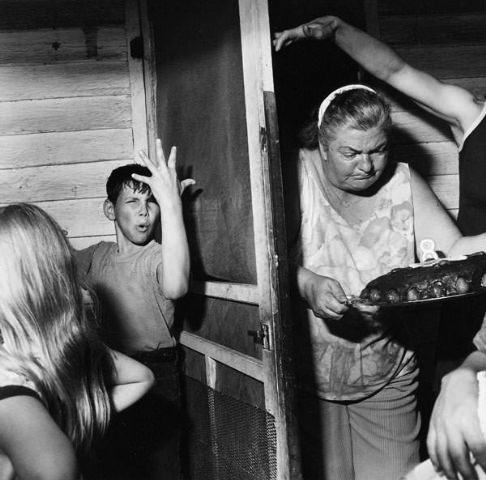 Others who studied with Lisette Model include Diane Arbus, Leon Levinstein, John Gossage, and Rosalind Solomon, among many other luminaries, in whose photographs can be seen aspects of Model’s aesthetic and social principles. Model’s instruction was philosophical, not technical: “Photography starts with the projection of the photographer, his understanding of life and himself into the picture,” she once remarked – a philosophy that Fink has embraced in his work.4 She underscored the importance of illuminating intrinsically human qualities like desire, power and vulnerability within human interchange, and encouraged Fink to focus on these basic human elements, which could be made evident through the photographic arrest of a gesture or expression. The power of Fink’s images stems from his ability to intuitively freeze moments that are pregnant with psychological import. Concurrently, Fink joined a group of what he terms “second generation” beatniks, who “were more crazed, more depressed, more engaged with their sense within quasi-history; destined to be holy sphincters on the horizon, to be representative of the spiritual search, to be using drugs of all kinds in order to enter the universe and another level of personal consciousness… .”7 Taken with a medium format camera, these works have a different feel from his street photographs and emphasize the observational role that he played. One senses that, though he was an accepted member of the group, he acted as the recorder of deeds rather than an immersed participant. In these romantic and intimate photographs, Fink tracks the renegade lives of his friends, who seem very much aware of the power of the camera. In 2006, Fink compiled his visual history in music in a traveling exhibition and book, Somewhere There’s Music. Sensitive and intimate, the photographs exude sound. Unlike the famous jazz photographs of William Gottlieb or Herman Leonard, who are icon-makers, Fink’s images show the performers as human and vulnerable. Memorable are his photographs of a beautiful young woman enraptured by music, Jimmy Rushing in a contemplative mood at a recording studio session, and Roland Kirk kissing and playing the hand of his baby, who is in the arms of its mother. In these, we see the humanity behind the fame. Fink peppers the undulating, cyclic sequence with abstracted details that act as counterpoints to the human melody. In these photographs, music becomes physical. We feel it in the attitudes of the players – their bodies in ecstasy – bent, bowed, exploding with the force of it. We also feel Fink enveloped by the music and are enveloped ourselves. The photographs that make up Social Graces are taken at two polar opposites of the social spectrum. A section of the book is given over to images that Fink made at a variety of museum and gallery parties. They show beautiful people engaging in frivolity, but also reveal how they too succumb to the frailties of human nature. Photographs of cavorting masses, doll-like visages and unreal bosoms are punctuated and punctured by deeply felt revelations — the lost and vacant expression of a woman captured in embrace, a glowing fist on a chest, or the long-fingered hands of a man on the back of a woman, whose golden locks are sculptural and shimmering. A natural offshoot of the society photographs found in Social Graces, Fink’s foray into the world of fashion and Hollywood peels back the transparent, crackling layer of artifice that forms the basis of the end products that we see in the glistening pages of Vogue and Harper’s Bazaar, on the runways during fashion week, and in the daily Hollywood newsmagazines. 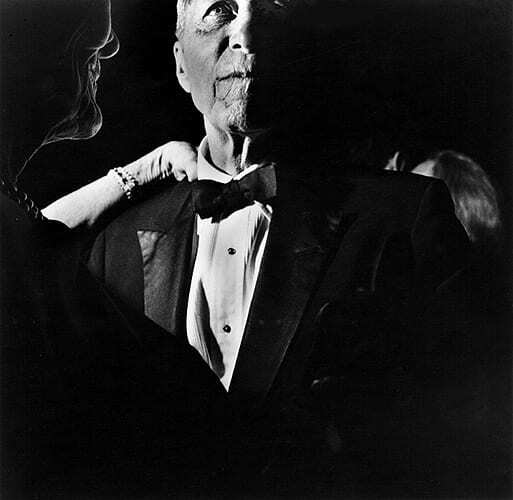 Perhaps even more devastating in some ways than his photographs in Social Graces, Fink’s fashion images go backstage to find real beauty underneath the manufactured: grace in the face of a veiled model or in a tender gesture to the eye of a blonde Madonna-like figure, who glows in the light of a flash surrounded by dark pressing throngs. True intensity, vulnerability and in particular, human-ness, are the things we normally do not see in fashion photography’s end-products, but Fink makes them present here. His Hollywood photographs, commissioned by Vanity Fair magazine, do not offer a sugarcoated, Vaseline-lensed celebrity, iconic perfection, nor are they images of a callous paparazzi. In these photographs, Fink captures the human moments to be found in a world of perfected artifice. The images are penetrating, but also loving, and reverential. These in particular are about raw sensuality and desire—the beautiful back of a starlet embraced in the glow of Fink’s off-camera flash, or a kiss stolen while a fellow partygoer sleeps in a chair nearby, echo Fink’s own appetites and desires. Yet, neither does he let his subjects off the hook. Fink exposes imperfections and creates them—illuminating the lines and lumps of bodies not entirely picture-perfect, and imposing his own shadow on that of a passing partygoer—underscoring his, and photography’s, role in this theatre of pretense. Fink’s lighting and printing techniques intensify the fleshy, corporeality of the figures. The images are about the physicality and the psychology of being. Fink has found personal voice in each of his commissioned projects and never separates the “art” from the “job.” Often, com- missions blossom into larger, personal projects. 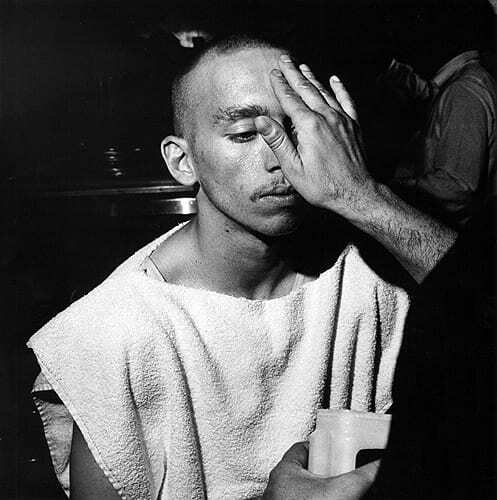 Somehow, the fact that Fink was asked to produce a series of photographs on boxing is no anomaly. The series, shot over 10 years between 1987 and 1997, which culminated in a book and exhibition at the Whitney Museum of American Art, began with an assignment from Manhattan, Inc., who sent him to a small gym in Catskill, New York. The subject captured his imagination and he spent the next decade visiting small gyms in the Philadelphia area, photographing to the memory-sounds of childhood radio boxing broadcasts.11 The dramas that he captured there were visceral and psychological. These small gyms, whose denizens are not the Don King superstars, but those who come to find physical release, fraternity and hope, also have a rich psychological life. In these images, Fink found beauty and grace. This beauty is not of the model kind, but instead can be found in the rough, sweaty grandeur that is the glistening, sculptural back of a Zeus-like figure, an enveloping satin hood, or a boxer transformed by a beatific touch into the image of a saint. Politics is a lot like boxing. Opponents spar and jab while the mass media plays referee. 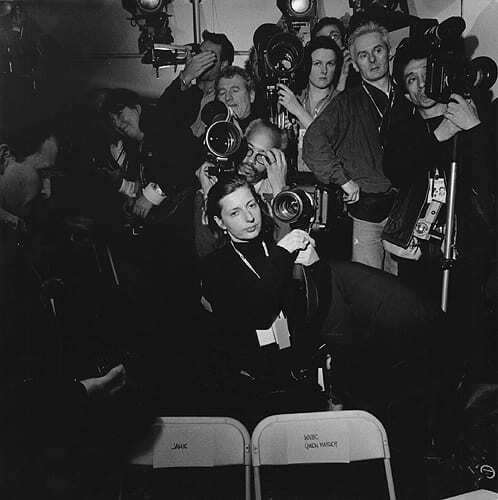 In 2008, Larry Fink went “backstage” for a series of photographs commissioned by Vanity Fair magazine during the presidential campaigns of Hilary Clinton and Barack Obama. It is no surprise that Fink did not record the official “photo-op” moments expected of press corps journalists. Instead we see images of Hilary Clinton caught in an awkward, stooping kiss or whisper, the adoring face of a woman regarding an encircled Obama onboard his campaign airplane, and the future president, exuding palpable charisma, rising like a demigod out of a sea of humanity. Like his fashion or Hollywood photographs, Fink uncovers those moments in which the guard is let down and the inner being, however flawed, escapes. Collectively, Fink’s images of partying socialites and Hollywood celebrities, fashion models and even boxers, can be seen as a monumental danse macabre, or dance of death. Like its late-mediaeval allegorical counterpart that portrays figures from all walks of life, from lowly laborers to kings and papal majesties, Fink’s images, in some ways, remind us similarly of the fragility and vanity of earthly life. The state of the human condition is a theme that plays through images that Fink has taken on a variety of travels, and in the greater body of his work. In the late 1980s, after the success of his Social Graces project and following the dissolution of his marriage to Joan Snyder, Fink spent time in Europe. There he captured images that were not typical travelogues, but instead recorded the small but important moments between people, and the poetics of place. In one image from a Condé Nast Traveler assignment, an ancient woman in the Côte d’Azur, France looks up at her caretaker, whose attentive face Fink places slightly out of focus in the far upper right corner, almost outside the picture plane. The woman, a nonagenarian, was once an important member of the Rivieran social world, but now lives in a villa surrounded only by her caretakers and staff.13 Another photograph taken in the same year captures a heightened moment between a man and a woman at a dining room table. His eyes are downcast and she appears to be anticipating his next words. In these photographs, Fink does not use artificial light, but instead makes use of existing illumination, and plays with shadow, framing and depth of field to elucidate the state of mind of both the photographer and his subject. In 1997, the Ministry of Culture of Matosinhos, Portugal hired Fink to “create a photographic record, historic and interpretive, of the two ways of life.”14 In the resulting images, Fink reveals the power of the collective to move work and life forward. Young and old participate to create the blood-dark wine, the grapes of which are harvested, pressed and celebrat- ed in their final liquid form. Fink’s photograph of a young boy carrying a basket of grapes up an incline in a field is powerful and devastating. We feel the exertion in his penetrating gaze. On the same trip, Fink also rendered disturbingly real Christian religious figures. He illuminates them in such a way that the fleshy, hu- man sculptures seem to carry the light of the spirit that they were made to exemplify. These sculptures are animated in the same way that his photographs of people are sculptural. Another important commission that resulted in a formidable publication, shared and paired with the work of the photographer Andrew Moore, was to photograph the work and workforce of the Cleveland Clinic. In these, Fink moves in as close as he can to his subjects, choreographing within the frame their interpersonal dances. Nurses, doctors, and other support staff are illuminated by Fink’s glowing light, which arrests movement and forms images that can only be compared to Old Master paintings. We feel the emotion of both the subjects and the photographer as he moves within hospital culture and unfolds life and death dramas and quotidian moments enclosed within vast, institutional architecture. 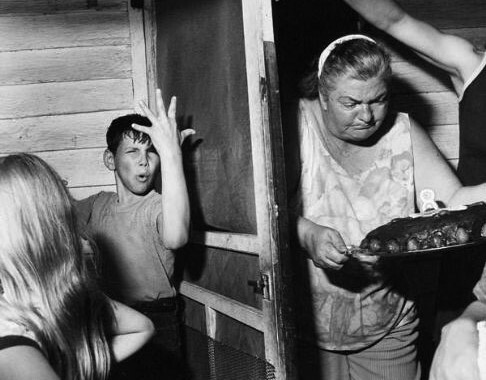 Perhaps the most moving and illuminating are Fink’s photographs taken of his home and family over the decades. These images are unabridged—raw and exposed, sweet and tender. They take us through the decades of his life and relationships that have included three wives, his only child, and a large, extended family. Too often, Fink is known and judged only by his “society” photographs, which provide only one layer of this complex artist’s vision. In this body of work there are wrenchingly personal photographs of his parents and grandparents, and images of his daughter Molly, the first which is visceral and raw as she makes her powerful presence known in the world. Another voluptuously lit image, taken a few months later, places baby Molly reverently amongst her toys like a sacred being in a Renaissance painting. Self-portraits too have found a consistent place in his artistic expression. Compelling and tender is the self portrait that captures a moment of bliss as his wife Martha embraces and kisses him. Another shows him with his now-toddler daughter—he looking slightly unsure—she confronting the camera head-on with fist extended. There are also lovely images of the family’s presence in his life—his daughter’s toys, a dinner plate, his dog and a glowing silver radiator that serves as a foreground to a view of his first wife, Joan Snyder, drying her hair. Then there are the portraits, which are full of unguarded moments – his mother crowned by Rhododendrons, Martha on the floor of their home playing with their dog, his sister Lizzie in the hospital, and activists Maggie Kuhn, founder of the Gray Panthers, and his mother Sylvia, on a couch. These images, into which the photographer has poured his soul and asks us to participate, provide us with a generous glimpse into the life and mind of the photographer and his kin. The flora and fauna in and around Fink’s farm is another little-known subject of his investigations. Poetic and sensual, with touches of the sublime, Fink captures low, dark notes in photographs of plants, insects and animals that have surrounded him there for 36 years. The images of vegetation and insects, like praying mantises and bees, are primal studies of the microcosm that is macrocosm. In the fecund, leafy undergrowth, are found miniaturized versions of human dramas that are both beautiful and terrible. Fink followed several mantises on his property for two years, capturing their “primal elegance.” In these images, Fink crawls into the world of the mantises, photographing them stalking prey and copulating through the canopies of vegetation. The undergrowth itself has also been a topic of discovery for Fink. He captures windfall pears, winding plant-life, his tiny dog, Rose, in a nest of long grasses, and a bumble bee magnified to fantastical proportions. There are also close-up studies of flypaper on which flies are fixed in their last writhing death agonies—a comment, perhaps, on the human condition in this time of conflict and war. Fink’s photographs have soul. They mirror our attractions and desires, exude generosity and passion, they are opinionated and uncompromising, as is he. These images, for they are images as much as they are photographs, show us our true nature as fractious beings, inclined to avarice, gluttony, pride and lust, among other biblical offenses, but also reveal our distinctly human ability for sensitivity, humor, hope, and foremost, empathy. 1 Robert Simons, “Interview with Larry Fink,” Pocko Blog, Wednesday, April 21, 2010, http://pocko-people.blogspot.com/2010/04/interview-with- larry-fink.html. (5-18-10). 2 Larry Fink, interviewed by Jowita Kepa, Tim Saltarelli and Phil Brideaux, “Interview with Larry Fink,” Toronto, Canada: Ryerson University, November, 20, 1998, http://www.imagearts.ryerson.ca/imagesandideas/pages/interview.cfm?page=195. 3 Laurie Dahlberg, Larry Fink (London and New York: Phaidon, 2005), n.pag. (essay, par. 8). 4 Lisette Model as quoted in Ann Thomas, “Model the Teacher, 1949-1983” in Lisette Model (National Gallery of Canada and New York: International Center of Photography, 1990), 118. 5 Email correspondence with the artist, December 20, 2010. 7 Larry Fink, commentary on series of photographs, published in the online magazine Visura, “The Beats: Larry Fink,” Visura Magazine, Issue 7, January, 2010, http://www.visuramagazine.com/vm/the-beats-larry-fink. 8 Larry Fink, untitled foreword, Somewhere There’s Music, essay by George E. Panichas (Bologna, Italy: Damiani Editore, 2006) n.pag. 9 Conversation with the artist, October 24, 2010. 10 “The pictures are taken in the spirit of finding myself in the other or finding the other in myself.” Larry Fink, original 1982 foreword (published as an afterword in the 2001 edition of Social Graces) in Larry Fink, Social Graces, essay by Max Kozloff (New York: Powerhouse Books, 2001), 119.
flamed by the stimulus.” From Larry Fink and Adriana Theresa, “A Moment with Larry Fink,” New York Times Lens Blog, January 5, 2011(1/6/10). 12 “A Moment with Larry Fink,” (1/6/11). 13 Dahlberg, notes to plate 20. 14 George E. Panichas, “Fish and Wine: Larry Fink’s Photographs of Portugal” in Larry Fink: Fish and Wine (Easton, Pennsylvania: Lafayette College, 1997), 5. 15 Larry Fink, “Death,” Blog Entry, Wednesday, March 10, 2010, http://larryfink.blogspot.com/2010/03/d-e-t-h-death-is-silent.html (1/4/11). 16 Dahlberg, n.pag. (par. 19). Posted in Essays and tagged Essay L, Larry Fink.